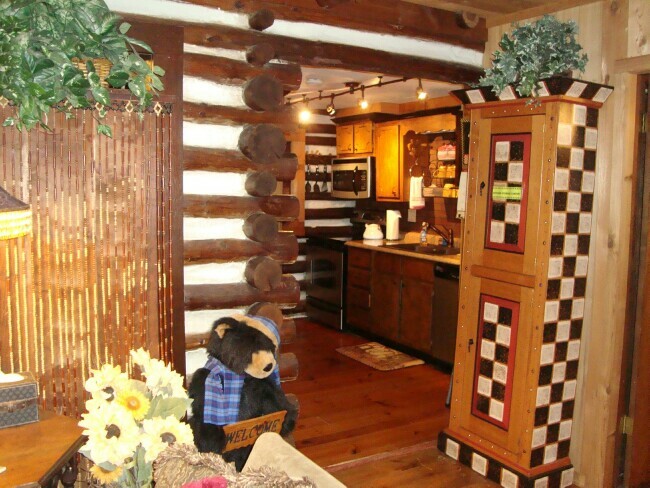 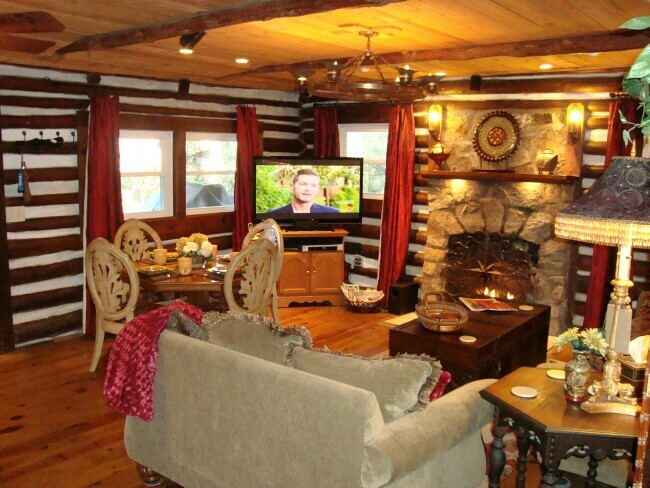 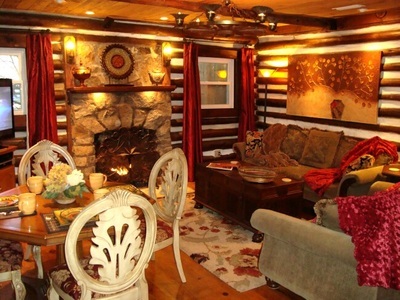 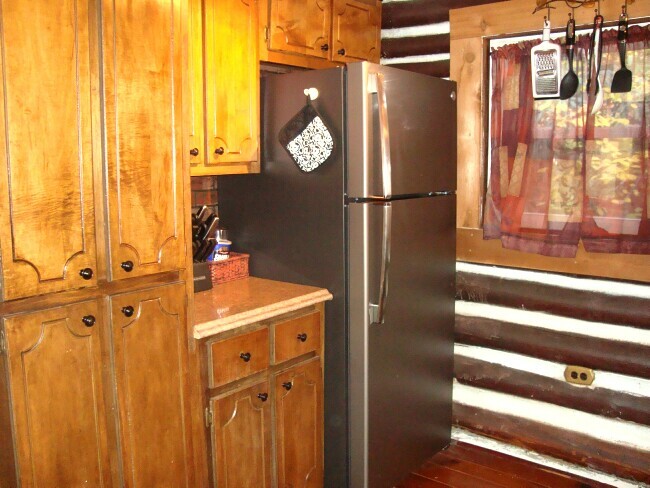 HERITAGE LOG CABIN: Delight in the nostalgia of old world charm of hand-cut log & chink walls, rustic stone fireplace, original wide plank wood floors, rough-cut cedar & log ceilings, covered rocking chair front porch…. 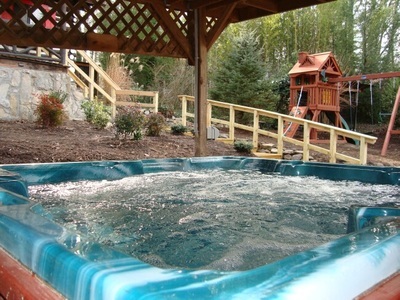 blended with the modern comforts of central heat & air conditioning, remote controlled gas logs, Jacuzzi bath tub, high speed wireless Internet, stainless kitchen appliances, plus the added luxury of a six person hot tub, kids playground, awesome massage chair, 50 inch HDTV & DVD player, lots of DVD movies, HDTVs/DVDs in both bedrooms, ultra-plush King and Queen beds, skylights, exquisite furniture and décor....and a fire pit for marshmallow roasts. Davy Crockett never had it so good! 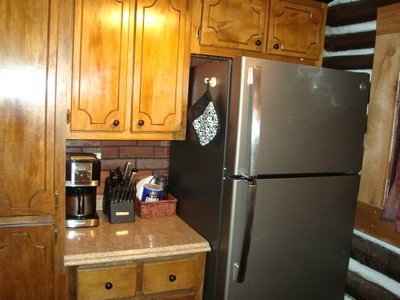 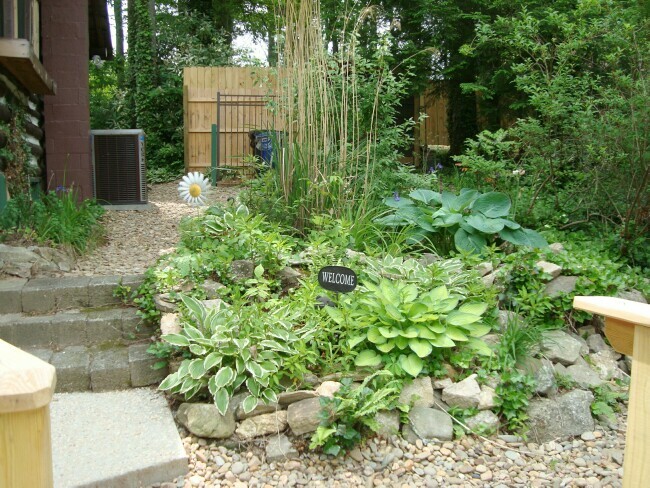 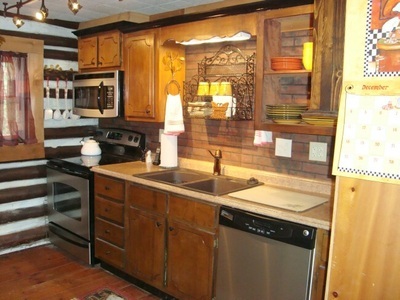 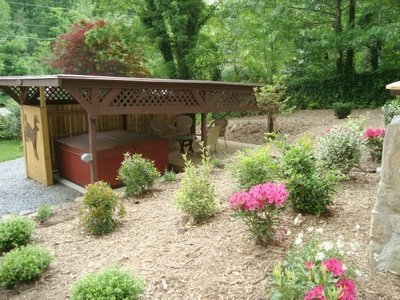 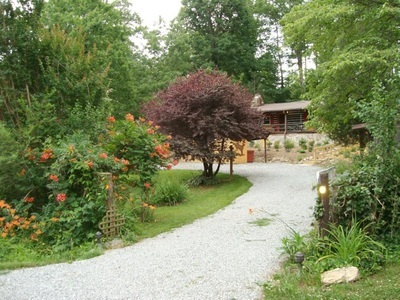 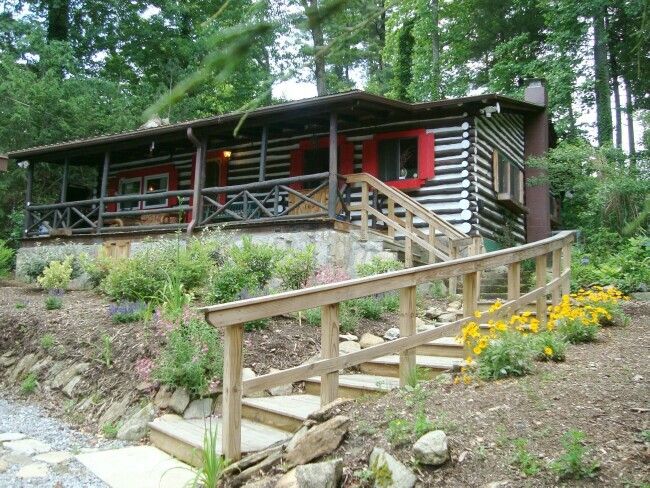 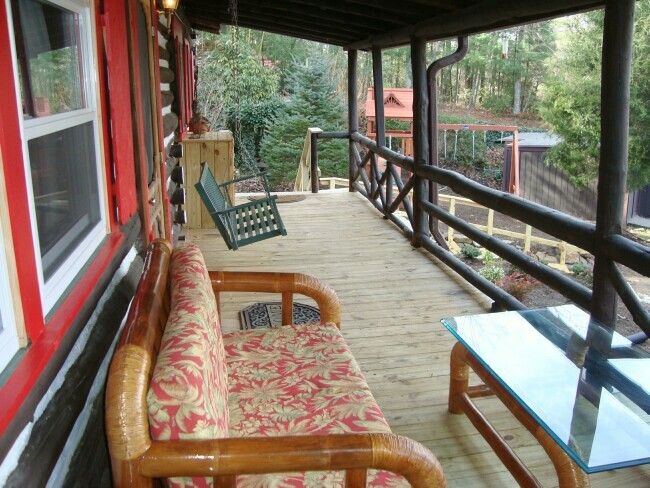 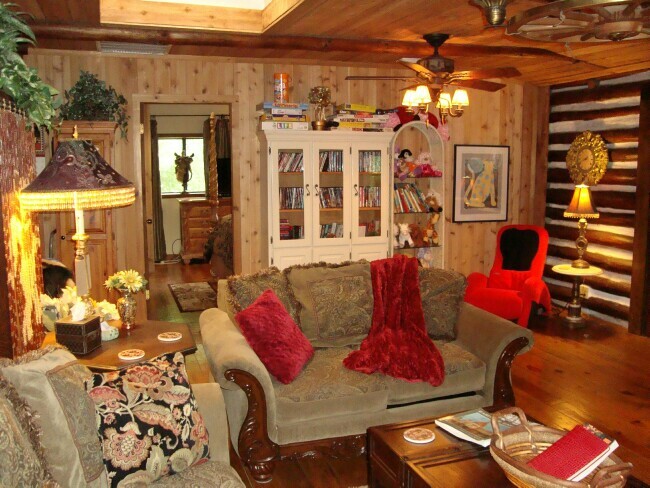 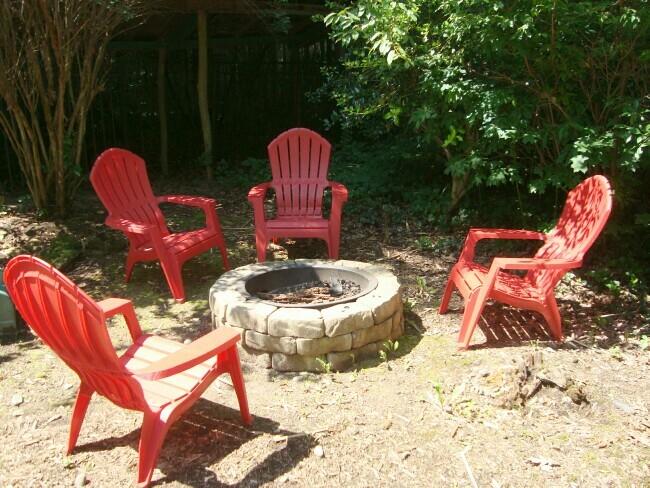 LOCATION: Just a mile from I-26 exit 49A and Hwy 64, this vacation rental is located in Hendersonville, NC. 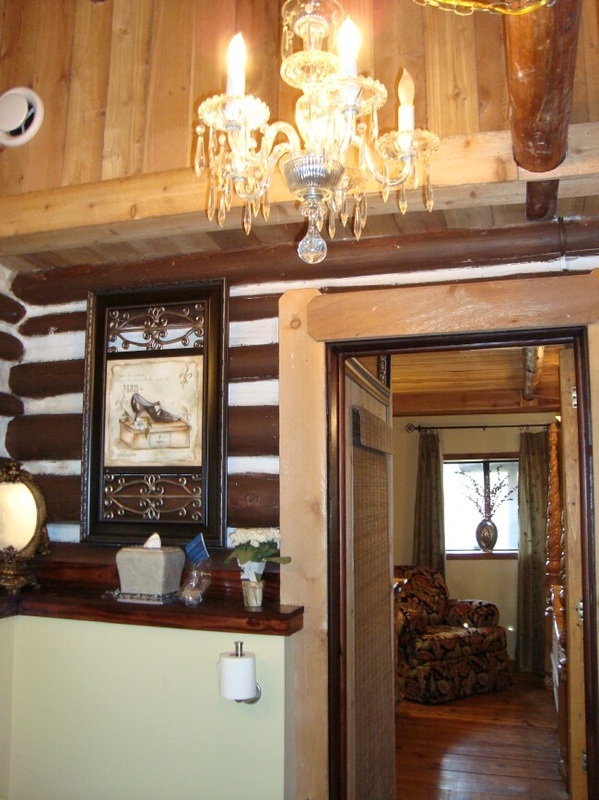 The HERITAGE LOG CABIN sits on a fully-fenced partial acre in a small residential neighborhood with less than a mile to a large shopping and restaurant complex including a Super Walmart. This convenient location is just a few minutes from downtown Historic Hendersonville Main Street shops, galleries and restaurants. 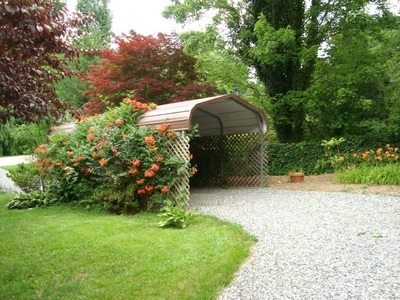 It’s a quick 24 minutes to downtown Asheville and the Biltmore Estate. LIVING ROOM: As you enter the 3 inch solid wood antique front door with iron door ringer, you’ll immediately feel the warmth and charm of a by-gone era. 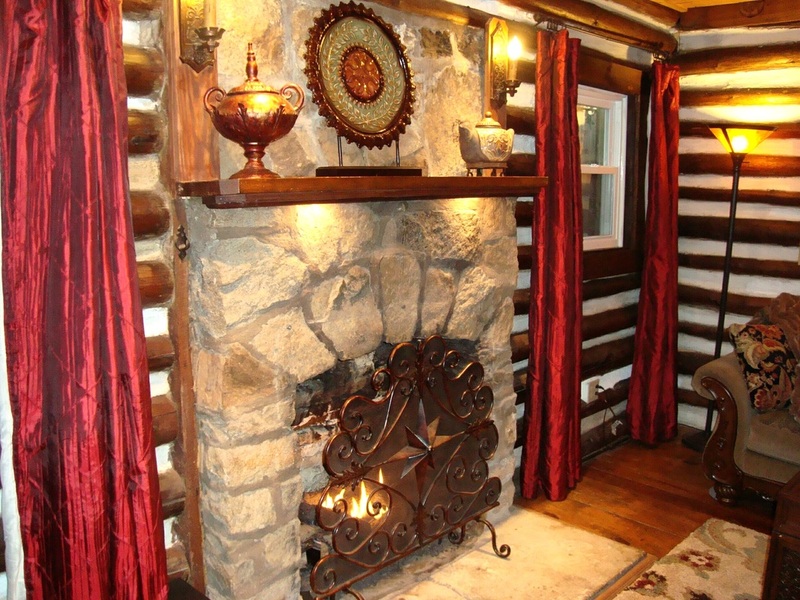 You’ll be enchanted by the stacked log and chink walls, the wide plank wood floors, the original wagon wheel light fixture, and the charming stone fireplace enhanced with warm ambient lighting and easy-to-use remote controlled gas logs. 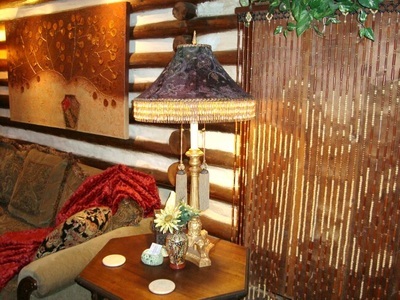 You are sure to appreciate the exquisite love seat and matching sofa, unique wall art and antique beaded lamp. 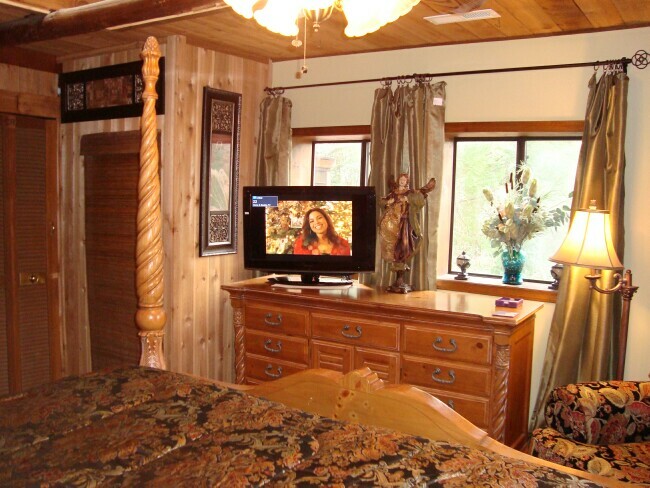 Relax while you watch the 50 inch HDTV with DVD player. 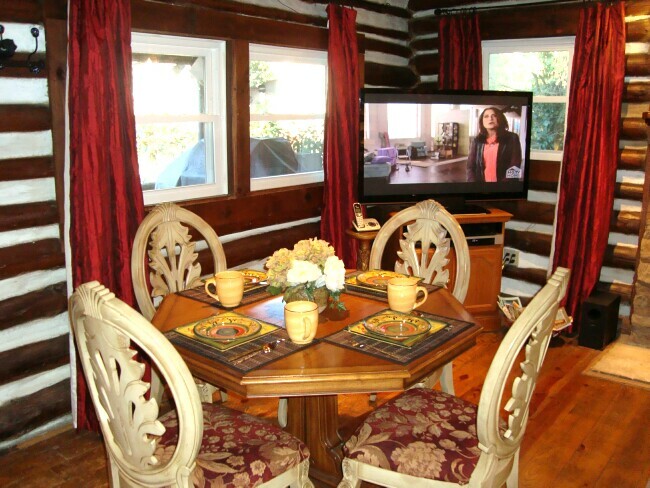 In front of the large picture windows is a dining table and chairs where you can enjoy a meal or play one of the many board games provided. 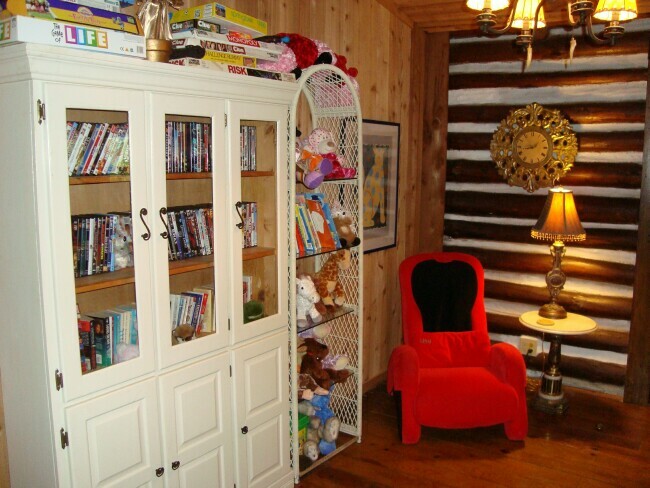 There’s even an awesome red massage chair for a great back massage and a cabinet full of kids toys, books and stuffed animals. You will love this Hendersonville vacation home! 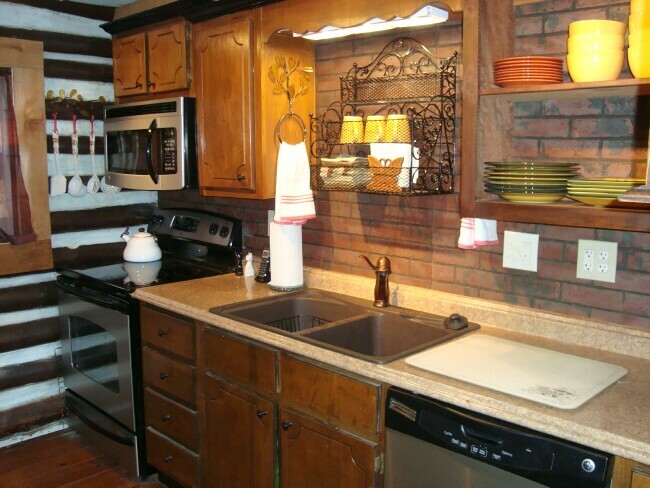 KITCHEN: You’ll delight in the kitchen with authentic solid wood cabinets, antique brick-like wall covering and wide-plank floors with new counter top, granite sink and upscale stainless appliances including a refrigerator, oven with ceramic cook top, microwave and dishwasher. Serve your meals on festive hand-painted dishes. 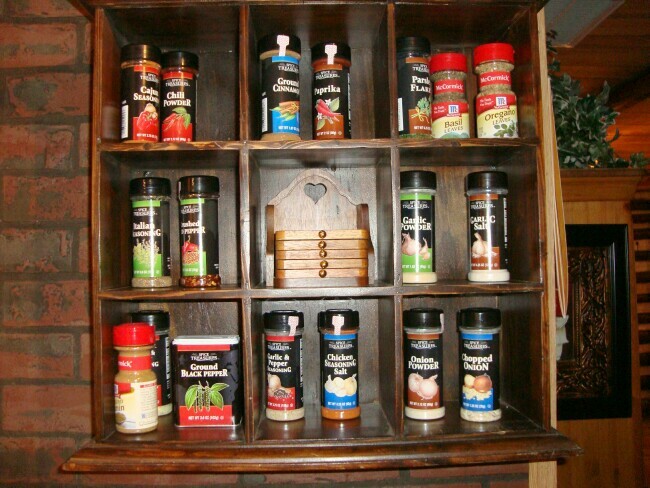 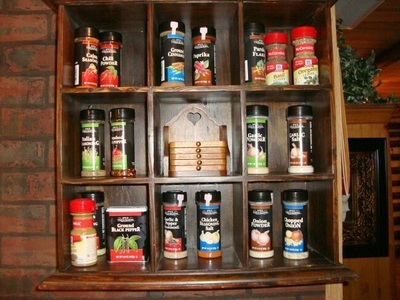 There are top quality pots, pans, bake dishes, bowls, cooking knives, coffeemaker and grinder, blender, crock pot, toaster, hand mixer, and much more. 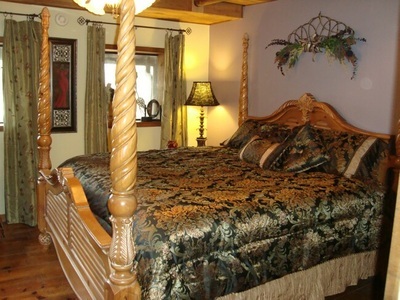 KING BEDROOM SUITE: The romantic master bedroom suite is luxuriously appointed with a gorgeous carved four poster king bed with a sumptuous top quality mattress, soft bed linens and elegant comforter. The ceilings are log and cedar with a skylight. The 32 inch HDTV has a built-in DVD player and a big selection of DVD movies. 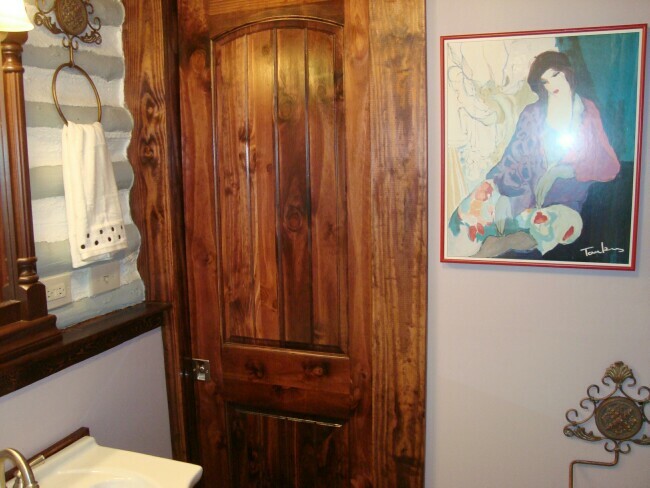 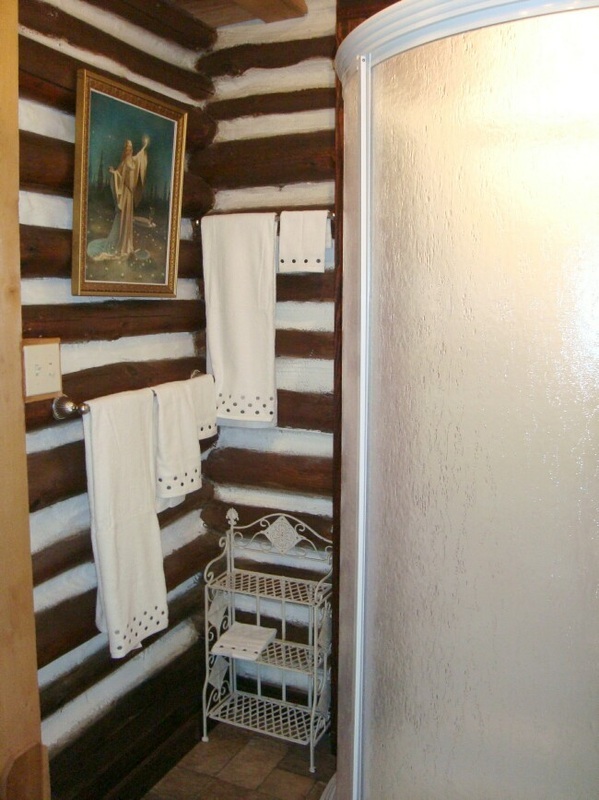 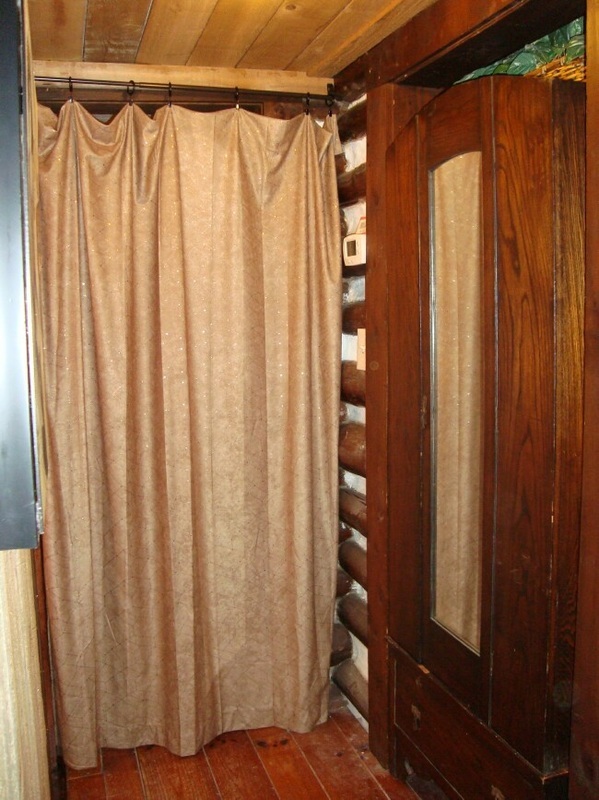 Your private bath with original log walls has a walk-in shower, furniture vanity sink, cathedral ceiling complete with a crystal chandelier and elegant artwork. 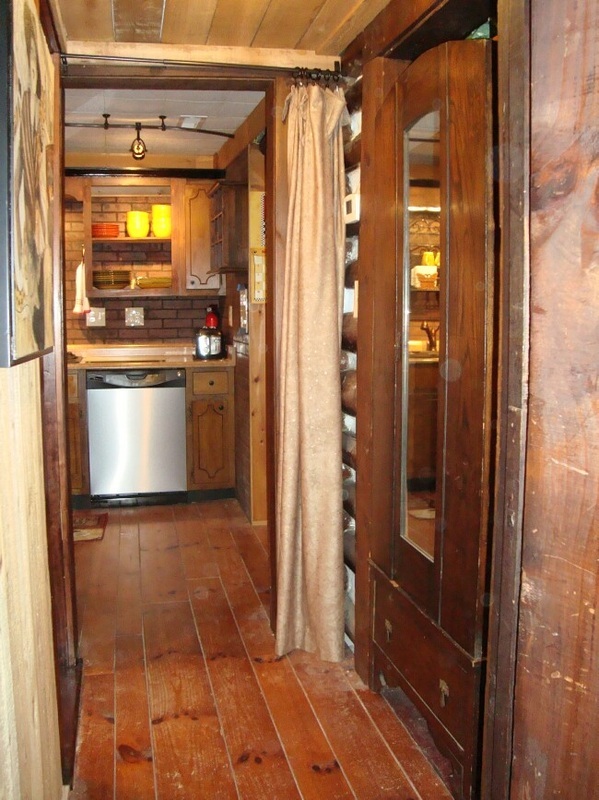 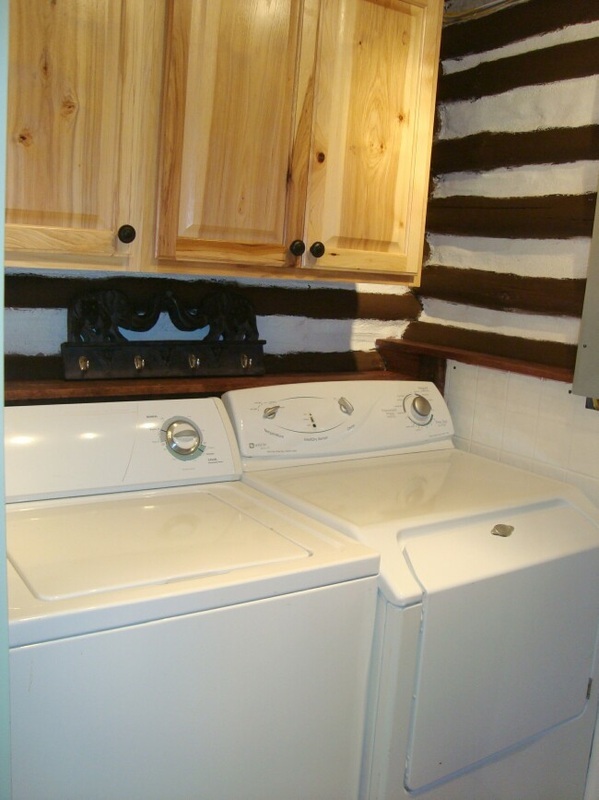 In the back there is a full size washer and dryer for your convenience. 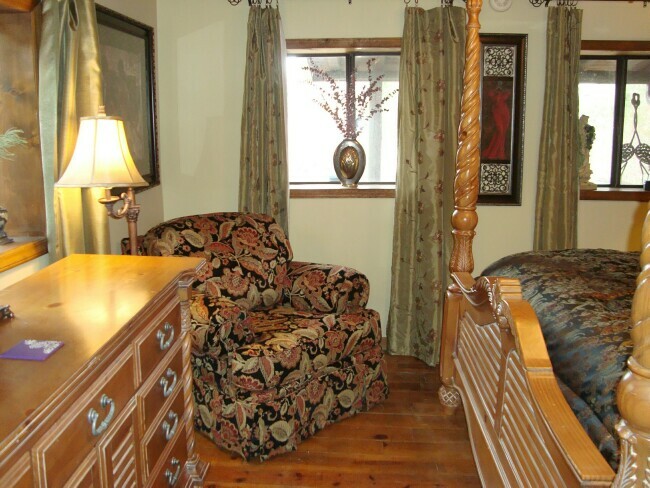 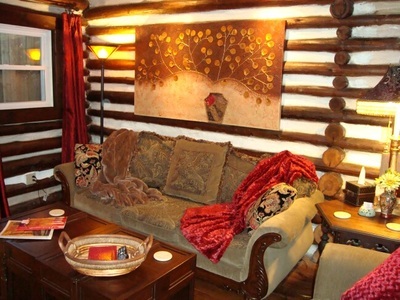 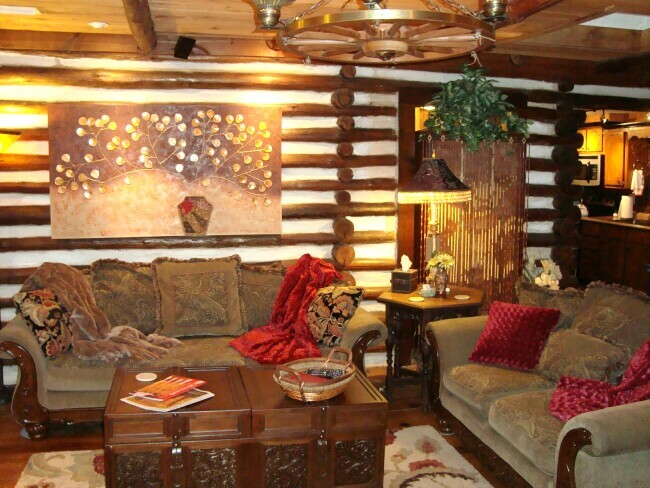 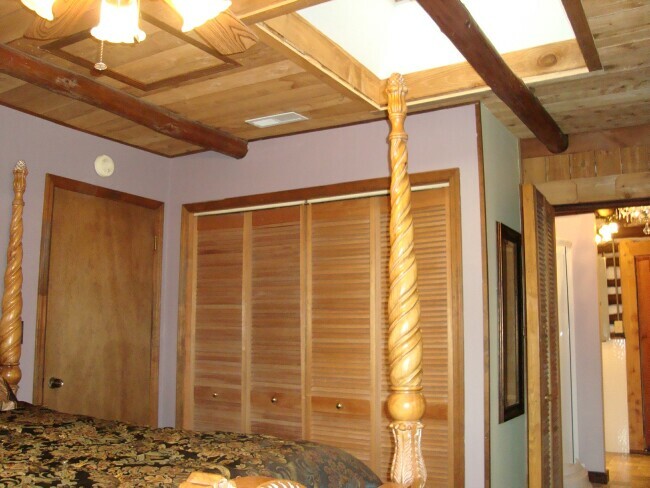 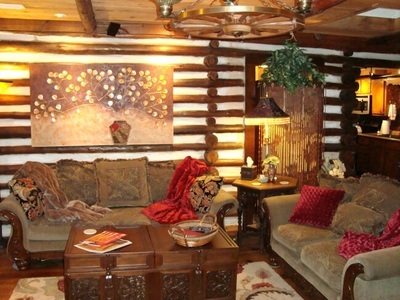 QUEEN BEDROOM SUITE: The cozy second bedroom has the warm charm of log walls decorated with a touch of whimsy. 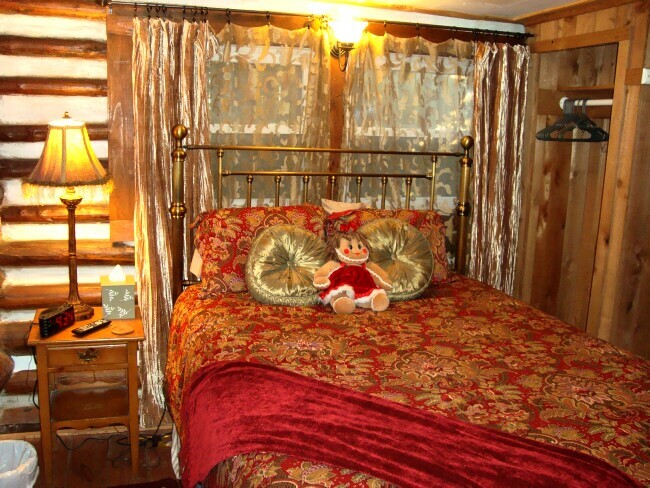 Be enchanted by the colorful red comforter on the plush queen bed mattress, sumptuous bedding and the unexpected jeweled artwork. 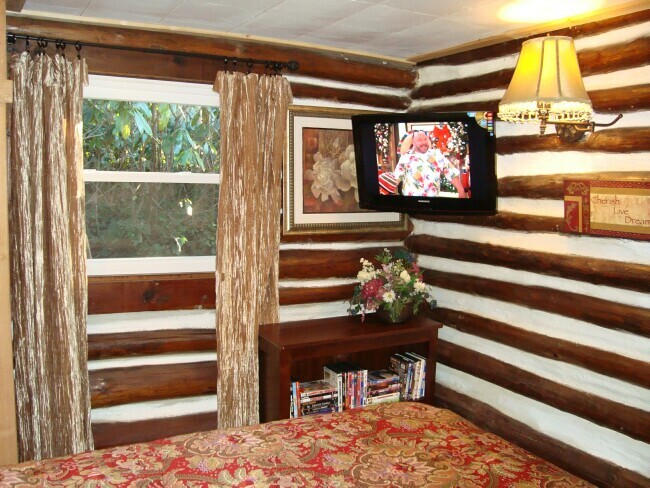 Suspended in a corner is a flat screen HDTV. 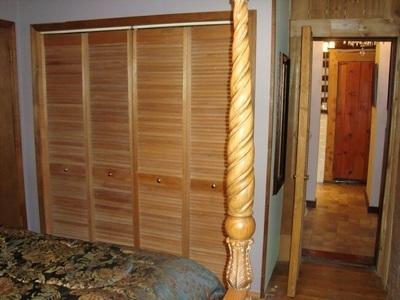 The small closet is supplemented by an antique wardrobe closet with full length mirror in the hallway. 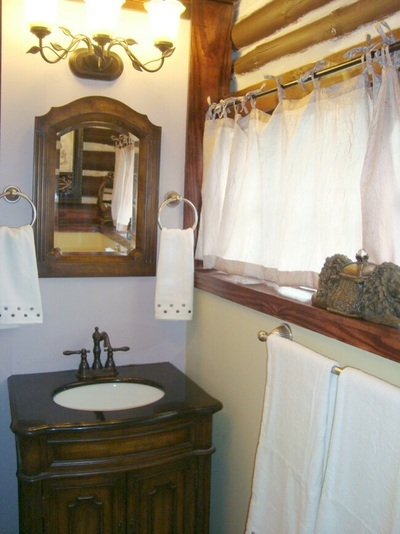 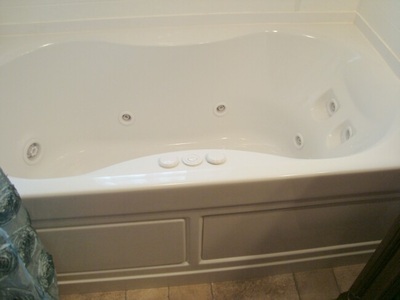 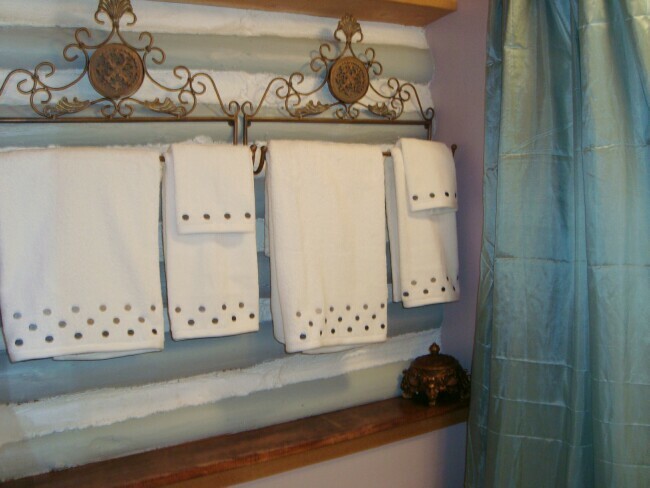 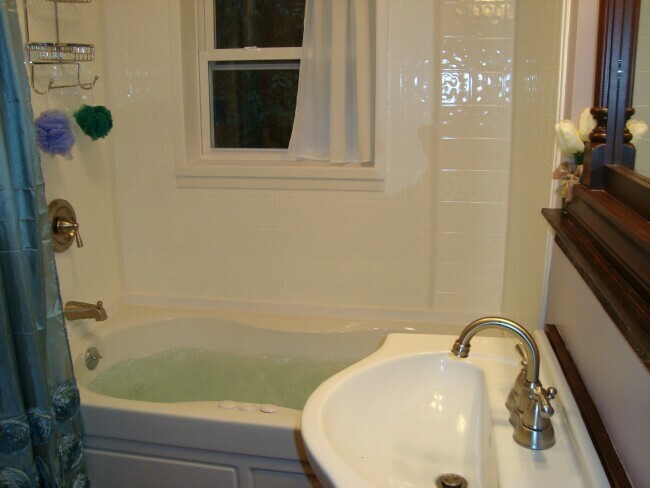 Your private bathroom has a deep Jacuzzi jetted bath tub, furniture vanity sink and log walls. For the additional guest, we have a quality twin air bed with a quick inflate/deflate motor and for a baby there is a crib as well as a Pack-N-Play. 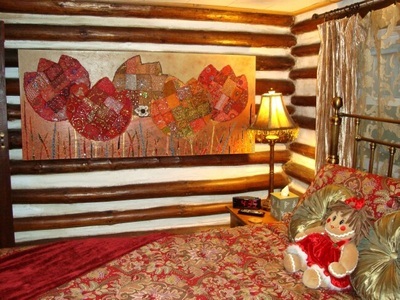 CHILDREN & BABIES: For infants, we have a small crib with bedding, Pack-N-Play, stroller and high chair. Kids love the stuffed animals, games and books we provide. 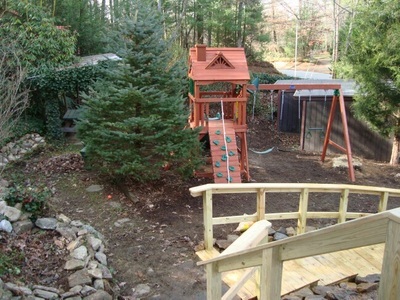 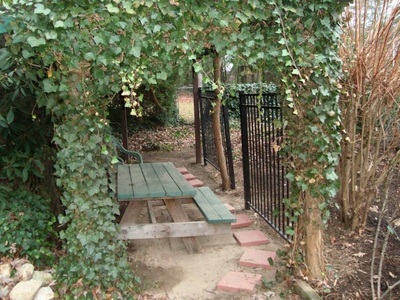 Outside is a delightful playground with slide, swings, fort and climbing wall for their entertainment. OUTSIDE: Enjoy your covered front porch with a suspended swing for two and a colorful red-cushioned antique bamboo sofa and tables. 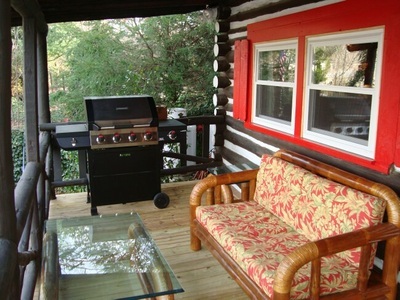 At the end of the porch is a propane gas grill for those delicious barbequed meals. 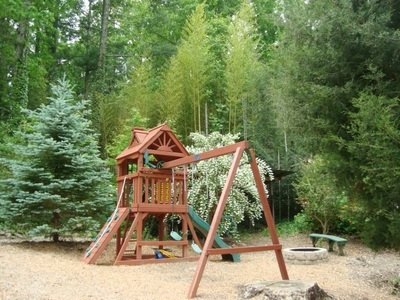 Beside the house in the yard, kids will have hours of fun playing on the PlayNation playground fort, slide, swings and climbing wall. 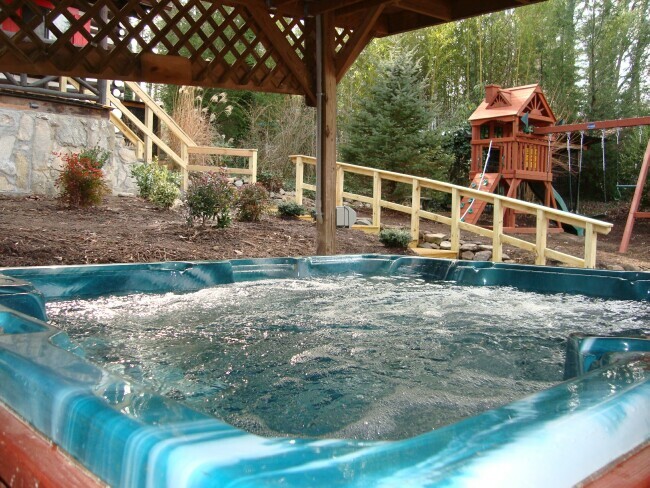 There is a large 6 person hot tub in a fenced covered area and just beyond that is a lawn with fruit trees and circular driveway.